Russell Crowe looks fatter than usual. Ben Affleck acts without showing much of emotion. Rachel McAdams is not as beautiful as in some of her other roles. 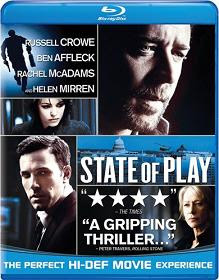 And State of Play's story is nothing you wouldn't expect from a movie like this. Don't be bothered with all of those cause State of Play has more serious issues to offer. As mentioned the film's story is nothing original. Cal McAffrey (Russell Crowe) is an investigative newspaper reporter who's writing about a couple of murders that have happened in a small alley. Then, after an accident with a subway train, another dead body comes in sight. It's of a woman who has worked closely with congressman Stephen Collins (Ben Affleck), not unfamiliar to McAffrey. Apparently she has also had an affair with the congressman. McAffrey suspects that all of the murders are connected so he starts looking deeper into the cases while trying to help Collins. To add some feminine flavor, the filmmakers have decided to add the young and ambitious online blog writer Della Frye (Rachel McAdams) as McAffrey's assistant and Cameron Lynne (Helen Mirren) as a masterful woman in charge of the newspaper. Russell Crowe is fatter in State of Play cause the movie has been shot just after Body of Lies for which Crowe gained some extra weight. Ben Affleck does not show miracles of acting but this is his usual approach of performing and to be honest I don't find it to be (always) necessarily bad. Unsurprisingly, Rachel McAdams is not the best actress either and she does not make her loveliest appearance here but it's probably because of her shorter haircut in this film. So, all of these are "flaws" to be expected and do not actually bother me. Well, the investigative team manages to do the job quite easily and it's kinda unrealistic but the ordinary excuse "It's just a movie" could work for a fault like this. And there is not a real confrontation between print journalism and its online counterpart but even if it was there, it would be a bonus anyway. The real issue that troubles me is the addition of an absolutely uncalled-for twist near the end of the film which spoils the entire State of Play movie that is otherwise not completely bad. You see, when everything in State of Play is settled and just waiting for a calm and commemorative ending, somebody decides to put another twist in. And as often happens, it does not work at least a bit. The twist starts with a standard question of the type "How does she know it?" and unfortunately, we don't receive an answer to this question till the end of the film. Instead, we just listen to a few newer "facts" without any proper reasoning behind them. And if this is not enough, the final appearance of the assassin happens at the "right" time and place but we do not understand what is his motive to be there. If you pause the movie and read what Cal McAffrey is writing on his computer at the very end of the film, you'll notice that the text does not match the events you've just seen in the movie. This could be intentional but it's rather due to a change in plans made in the last minute. To be honest, State of Play is not such an awful film if you watch it until a pen necklace shows up. Of course, I don't believe you will watch the movie almost until its end and skip the stuff after the necklace scene so be prepared for a dose of disappointment and a quick emotional landing. But don't worry! The movie never actually takes off considerably so you won't be falling from too high. Explore our Review Maze to read other movie reviews.